A good many people went into print to tell their story immediately after the Great War and quite a lot of the output has become quite difficult to read a century later. The writing style and the language can act as barriers to engaging with the authors and their accounts of war as they knew it. Many writers of the period drew a veil over the horrors they had seen and we want so much more today. Schooled in movies and computer games, hardened by twenty-four hour news and the bombardment of social media, we do not tend to appreciate the mores of people who knew much of their audience were happy with self-censorship. They had no need for gore and violence for its own sake because all too many of them had seen plenty for themselves. This book is about as far removed from Battlefield One as you can get and yet people die horrible deaths and others suffer appallingly. Captain John Everard Gurdon, DFC, was just twenty when his combat career finished in 1918. He had suffered wounds on a few occasions and a final encounter with an anti-aircraft shell was enough for doctors to send him home. He had accounted for twenty-eight enemy aircraft in little more than four months. Think about all of that. Gurdon was a gifted writer in addition to being a very good fighter pilot. When his military career faltered he turned to the pen and worked his way through a number of jobs, including being a sub-editor for The Times of London. He wrote short stories and guidebooks and perhaps his crowning feat was translating the history of the German air service in the Great War when he was aged just twenty-three years old. He certainly packed the experiences in during his lifetime, but sadly he had a dark side and did not prove to be the wholesome family man the times called for. There is little doubt that post-traumatic stress was the principal cause of his character flaws and his wife and children were on the wrong end of it. It is hard to understand how a young man who had been through so much could not have been affected by the war he had fought and witnessed. He chose to write a semi-fictional account of his war service, changing names and mixing up events to hide his real story, but in reading this book it quickly becomes evident that he could not have written it without the experience. The language is old, a bit like reading John Buchan or other writers of the period. 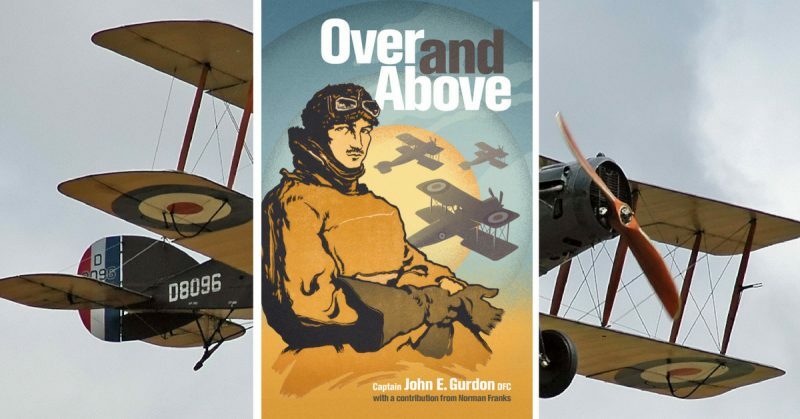 The book has the feel of a good yarn to go with all the Biggles-like stuff doing the rounds; but Gurdon had seen burning men fall to their deaths and watched Fokker Triplanes ignite in a hail of bullets. He had lost friends. There are bits that jar but make perfect sense. The language of his faltering attempts at romance echo the upper-class twit George in Blackadder Goes Forth but this, again, was the style and convention of the day. We mustn’t criticise him for this. Grub Street has re-issued a number of Great War aviator books and this one is up there with the best of them. Gurdon, as Warton, is heroic and tragic. He was just a kid. Imagine the youth of today climbing into a fighter and shooting down twenty-eight enemy aeroplanes in the length of a summer madness? This book is well worth reading to appreciate the author for the brave and flawed young man he was. In later life, Gurdon lived in straitened circumstances, the consequences of the decisions he made as a younger man. Perhaps he had cause to regret them, or maybe he believed that his life in 1918 was the best it could ever get and nothing else mattered. He was an ace and another war hero to remember. He was a good writer and perhaps his personality improved with age when the effects of his exposure to war had worn off a bit. It’s important to remember that he also served in a second one. He really was a man of his time.